When Mary told me her bright wedding color scheme during our consultation, I couldn't have been happier! You see, 2016 was unofficially the year of the blush for many of our brides. Now blush is absolutely beautiful and romantic and lovely, but I was dying for some color! Hence the gorgeousness that ensued for Mary and Brian's August wedding at Eastland Suites here in Bloomington. To top it all off Stephanie Bartman captured it beautifully! Go check her out! Mary's bouquet was made up of brightly colored stock, pincushion protea, roses, dahlias, ranunculus, amaranth, hypericum, and succulents! All excellent summer bouquet options. The boutonnieres were made of mini succulents and yellow billy balls with eucalyptus foliage and wrapped in twine. The oh so wonderful Becker sisters. Stay tuned for Cassie's wedding on the blog soon and a special post featuring all three of their weddings! 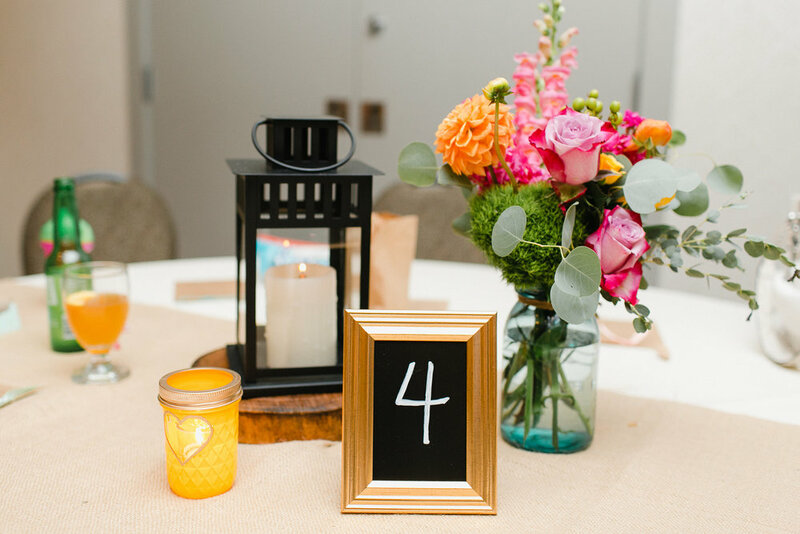 Mary's centerpieces were simple blue mason jars filled with more colorful florals. Here's to more colorful weddings in 2017! This wedding from last summer is giving me all the heart eyes!!! I just got my hands on these gorgeous photos by Stephanie Bartman Photography and I couldn't wait to share them! Elise was another of those absolutely sweet brides that was referred to my through a friend and being that we were located a distance apart at the time, we planned all the florals over the phone! The result was absolutely gorgeous and I was so glad to play a small part in her big day! Elise's bouquet was a gorgeous mix of ivory roses, spray roses and stock, mixed with burgundy garden roses, dahlias, and amaranthus with silver dollar eucalyptus foliage. A great combination!